Productivity, in a nutshell, is merely the act of producing or creating. This can range from cooking and cleaning in your own household to completing numerous marketing campaigns for your company’s top clients. In either case, simply getting yourself to the point where you are operating at your most productive and efficient levels can be a task in itself. With the numerous distractions of the modern world, and lack of mental focus overtaking a worn-out workforce, figuring out the best way to get into a higher capacity of production can be a daunting project. When it comes to being more productive, everyone has a theory as to what works best. While certain methods can work for some, those same methods are not necessarily best suited for others. So, how can you get yourself to your highest operating level? Perhaps one of the following common myths about productivity below will lead you in the right direction and get you moving towards a much more productive and rewarding future. Many people believe that getting more work done equates to working more hours in a given day. Luckily, this is not always the case. Just because you have more time does not mean that you will actually get more done. Everyone knows at least one person who can easily waste hours of a day, working on the exact same thing without even batting an eye. In that same amount of time, a more productive person could have completed double or triple the amount of work by simply working smarter. Working more efficiently is the best way to be productive. By focusing on the task at hand, and the end goal, you can easily get into a rhythm and produce exponential amounts of work. Controversy has surrounded the topic of telecommuting for quite some time, but it is easily argued that working from home is just as effective as working in a company’s office. In fact, there have been studies conducted showing that telecommuters were actually more productive, overall, than their in-office counterparts. It can be said that companies shying away from telecommuting may be hindering the productivity of some of their employees who are better suited for a non-office environment. Consider the option of telecommuting if you think it is the right fit for you. Multitasking was thought to be a great way to increase productivity, since in theory you could get more done in less time. However, when working on numerous tasks at a time, you aren’t actually being as efficient as you may think. It has been shown that going back and forth between tasks lessens productivity. Also, those who partake in multitasking are much more prone to distraction since they are not focusing on just one task. The stress of numerous tasks at one time takes a huge toll on your brain, as well, leaving you mentally exhausted and unfocused, as well as decreasing performance levels. Moral of the story – focus on one task at a time, complete it efficiently and productivity levels will rise. Let’s just get one thing clear. Being busy and being productive is not the same thing. Busy work can make the time go by faster or may make it seem like you are getting a lot done, but in reality you probably aren’t getting much actual work completed. There are numerous fillers that keep you busy, such as searching the internet or constantly checking your emails, but you need to do work that is more meaningful and purposeful in order to truly be productive. To keep productivity high, try making a list of the things that you need to do and then manage your time effectively to actually see what you are producing in a day. Seeing what you are capable of accomplishing on paper can lead to even higher levels of productivity down the line, since you will know the best ways to get a task done. Contrary to what many people believe, taking breaks throughout the day is such an important component of being productive at work. But in reality constantly plugging away at your work and staring at the never ending stream of emails without a breather is just not healthy. Your body and mind need that break to clear your thoughts and alleviate stress that can build up from a growing workload. While these breaks lead to greater concentration upon return to your work station, they need to be concise and efficient. Taking too many or too long of a break can have a negative impact on workflow since it leads to procrastination. So, keep the mental breaks within a limit and watch productivity improve. Let’s face it, waiting until the last minute to get something done is never the best way to go. In reality, it is just an excuse to not to do work. Some people think that the pressure to get a project or task done helps them, but at that point all you can really do is complete the task. You are not conducting your best work and it will be apparent. So, how do we amend this habit? Prioritize your work. Know when something is due and how important it is, and don’t push it to the back of your mind until the last minute. Have an organized system of evaluating the importance of a project, with due date in mind, and go from there. Naturally, there are people that just aren’t alert in the morning. There are also plenty of people who can still be productive without waking up in the early hours of the day. However, waking up early or at least earlier than you need to, can actually help you to get more work done. Yes, those are a few extra hours for you to potentially work, but there are other benefits that you can reap without working more hours in a day. It has been shown that exercise makes you more productive and gives you more energy to utilize throughout your day. Also, this extra time allows for you to consume a healthy breakfast in addition to your workout routine, giving you added fuel to produce at a higher quality for the rest of the day. Psychiatric issues such as ADHD and ADD are becoming more prevalent in the workplace, but that doesn’t mean that productivity has to become obsolete. Obviously there are medications to help with these distractions, but there are also therapies such as neuro-biofeedback, which train the brain to operate more effectively. This type of therapy has been shown to drastically increase the level of brain function in people with cognitive issues such as ADHD, thus leading to higher rates of productivity. Organization might not come naturally to everyone, but that is no excuse not to keep your work space tidy. According to some surveys, two weeks out of the year are wasted by workers due to searching for misplaced items. Think of how much you can get done in two weeks’ time. It’s crazy to think that most people lose this time, thus losing their ability to complete as much work as they possibly can. Everything in your work area should have a space that it belongs in and should be organized in a way that it is easy to find what you are looking for. Remember, organizing isn’t something that you just do once and forget about – you need to stay on top of it every day in order keep productivity high. While listening to people yelling back and forth is not a conductive environment for productivity, neither is one of complete silence. Studies have shown that the presence of ambient noise actually leads to greater creativity and concentration. The noise level is of importance for this to be effective, but background noise such as chatter from a coffee shop can allow people to produce more work and generate more ideas. Unfortunately, not everyone can sit in their local café throughout the day, but there are numerous apps and online resources offering ambient noise to help you to be more productive. Being productive is something that everyone strives for and hopes to attain. 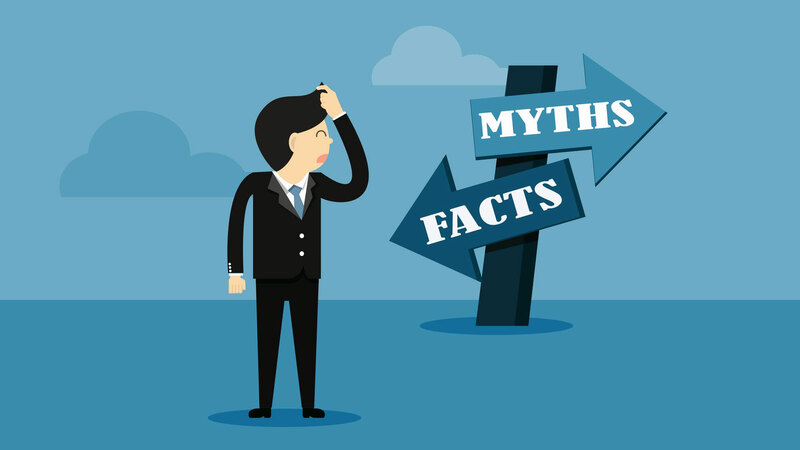 By ignoring these common myths and taking the accompanying suggestion to heart, you can certainly get yourself to the point where you are efficiently and creatively producing. Staying organized, taking mental breaks and working smarter are just a few great ways to keep your workflow moving at a high level, and by reaching an adequate level of productivity you can lead yourself to a happier and mentally healthier life.